In the event you do not want to be spoiled, just know this. I loved it. Now, stop reading this review and go read the book! 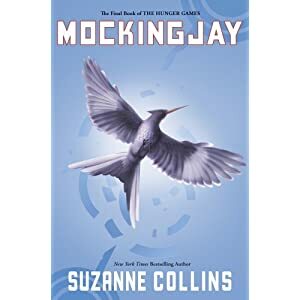 I finished Mockingjay (The Final Book of The Hunger Games) a few days ago but needed to take some time to think about it before blogging. I think I am ready now! I loved Mockingjay. I know a lot of bloggers and readers were unhappy with the direction that Collins took the book in, I thought it was sheer perfection. When we last left Katniss, she was the face of the revolution. But what many readers seemed to forget was that she was chosen as the face of the revolution. It wasn’t a choice she made independently. I have always loved Katniss but I never saw her as a perfect hero. She is flawed. She is human. She breaks and tries to heal. She makes mistakes. (I’m pretty sure Peeta and Gale can tell you all about those mistakes). In Mockingjay, we meet Katniss in District 13. For the first two books we have imagined District 13 as this utopia, a community that fled the Capital and and has been able to live secret, joyful lives. You know, the kind full of butterflies and rainbows. Guess what? Turns out District 13 is no utopia! While they aren’t the Capital, they are terrible in their own way. And they have plans for Katniss- she will be their spokeswoman and the inspiration to the rebels. They have plans to film promotional footage of her and air it in all the districts. But it turns out that this is just more reality television. She is scripted, she isn’t in real combat, and she hates it. But when she does get pulled into the war, things aren’t as clear as they once seemed. I’m not going to bother summarizing the rest of the book. Just know that Mockingjay is different from the rest of the series. There is not clear-cut good vs. bad here. The lines are blurred and there is a lot grey area. It’s difficult to figure out what side anyone is on; it’s difficult to figure out what side YOU, the reader are on! While the first two books felt very character-driven, Mockingjay is driven solely by something else. Character, setting, plot all rolled into one. It’s war that drives everything. And Mockingjay is real war. People die. Good people die, for senseless reasons. Because we view the events through Katniss’s eyes, the book is rushed at some points. At other times, we miss things because she is injured or drugged (in the hospital). It is confusing and overwhelming. But I felt like I was right there with Katniss. For those of you who want a happy ending you aren’t getting that here. But what war ends with happiness? Like real life, the war just ends. And Katniss is broken. Her family is broken. We know she begins to heal, because there is an epilogue. Unlike many other people, I enjoyed the epilogue. I think it gives us just enough information. We see that Katniss has grown up, that she is living her life and moving on. But she still bears the scars of what happened to her. She will never be the same person she was when she stepped up and took Prim’s place in the games. Like I said, I LOVED the book. I though Collins did a fantastic job and took Mockingjay in a direction that many people did not expect. Because of this, she has some unhappy readers. But I am a fan for life. Thoughts? Questions? Comments? I want to talk about this one! Comment! What a scathing look at humanity. Yet sadly true when you look at world history. 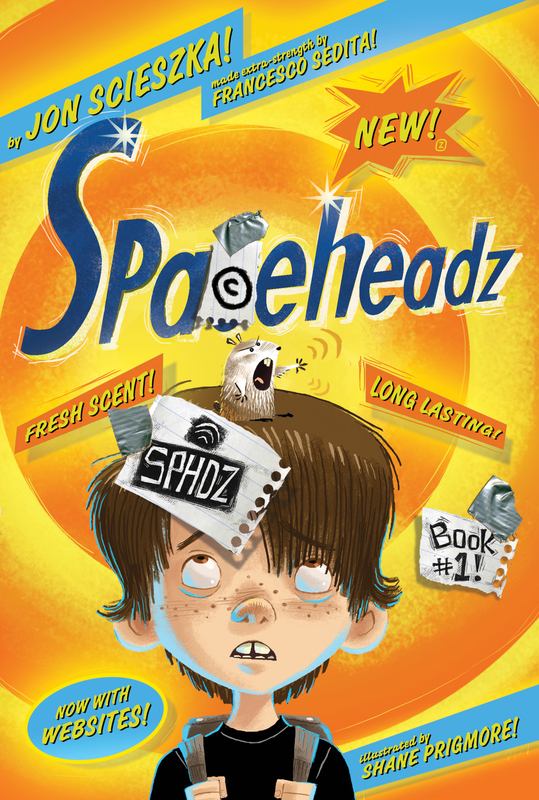 Spaceheadz Blog Tour starring Jon Scieszka! 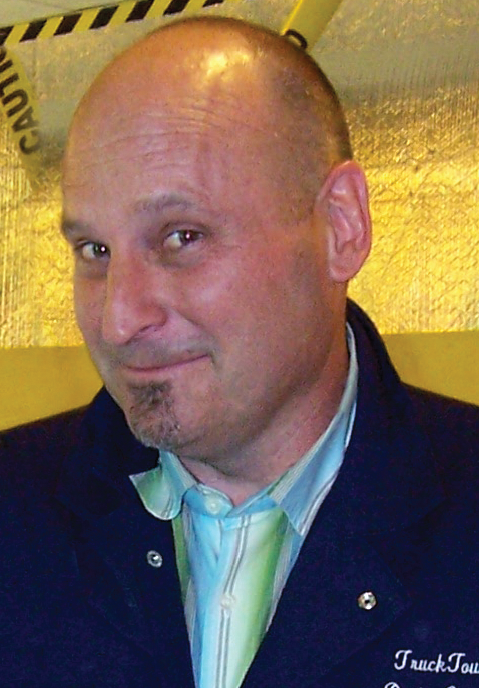 I am thrilled to be hosting Mr. Jon Scieszka today on his blog tour for his new middle grade book, SPHDZ Book #1! (Spaceheadz)! SPHDZ Book #1! is absolutely hysterical! While it is aimed at younger readers, on the lower end of the middle grade spectrum, I still found myself laughing out loud. Part comic book, part prose, it will be hard to tear this one out of young readers’ hands. The book is the perfect combination of an actual, physical book and pouring over a physical book with the technology that kids love. Michael K. just started fifth grade at a new school. As if that wasn’t bad enough, the kids he seems to have made friends with apparently aren’t kids at all.At first, they just seemed super weird. Then, they announce that they are aliens. Real aliens who have invaded our planet in the form of school children and a hamster. They have a mission to complete: to convince 3,140,001 kids to BE SPHDZ. But with a hamster as their leader, “kids” who talk like walking advertisements, and Michael K as their first convert (and only convert), will the SPHDZ be able to keep their cover and pull off their assignment? Today, I am happy to announce that Jon Sciezka has created some exclusive content for TheReadingZone readers! Rather than explain it, I’ll let Mr. Sciezcka take it away…. Want to know more? Major Fluffy also has a blog at http://majorfluffy.wordpress.com/ and tweets @majorfluffy. 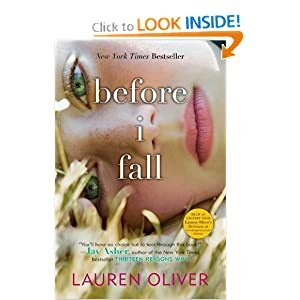 For months I have been hearing buzz about Lauren Oliver’s debut novel, Before I Fall. It never made it to the top of my TBR pile because I had so many middle grade books to read for my sixth graders, but the buzz convinced me to pick up an ARC of her second novel back at BEA. So last week I grabbed my copy of Before I Fall and sat down to read it. Boy am I glad I did! I can’t wait to booktalk Before I Fall to my new high school students. Not only is it well-written but it is also thought-provoking, meaningful, and realistic. Sam Kingston is popular. She is pretty. Her friends are pretty and popular. Once upon a time, Sam was a loser, way back in middle school. But now she isn’t. Now she is one of the chosen few. She is also pretty oblivious to how her actions and those of her friends affect her classmates. Sam isn’t particularly likeable. I didn’t even love her at the end of the book. But she is realistic. So are her friends. Oliver has captured high school perfectly. A lot of seniors are selfish, they do think the world revolves around them. Being popular is important, and sometimes that means stepping on those around you, as Sam explains. 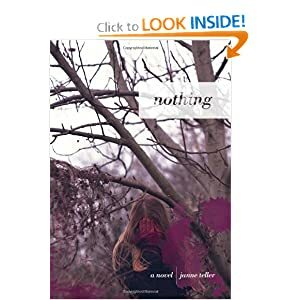 But everything changes for Sam when she hears, “a horrible, screeching sound—metal on metal, glass shattering, a car folding in two,” and then everything turns to nothing. The victim of a car crash, Sam is convinced she has died. Until she wakes up again then next morning. Only it is not the next morning. It is the same day. A cross between Mean Girls and Groundhog Day, Sam is forced to relive her last day over and over, changing her actions a little more each time. Lauren Oliver takes a fascinating concept and turns it into a thought-provoking novel. How does bullying affect our lives? Directly? Indirectly? How do our actions influence those around us? Can we influence them consciously? At first, Sam lives with reckless abandon, doing all the things she never had the nerve to do when she was alive. But slowly she begins to realize that she is meant to do something else. What I really liked about this book was how realistic is, despite the premise. When Sam begins to relive her last day she doesn’t immediately transform into a perfect teen. Instead, she rebels more than she ever did as a living teen- seducing her teacher, smoking pot, cheating on her boyfriend. She slowly begins to realize that something has to change in order for her to move on completely. But even at the very end of the book, she is not a perfect angel. She does change and she matures, but she remains a teen at heart. While some people might not appreciate this unwillingness to become perfect, I love it. It is realistic. And teens will identify with it. Some people mentioned being apprehensive about reading 480 pages about the same day over and over, but the story is not redundant at all. I found myself completely enthralled by the book, despite the fact that Sam was reliving the same day. Each choice she makes impacts the outcome at the end of the night. Highly, highly recommended. Perfect for high school. This year I will be reading Lord of the Flies with my seniors, so when I saw Janne Teller’s Nothing called a “Lord of the Flies for a new century”, I added it to my TBR pile. Last night I pulled it out after doing some planning and I read it straight through in one sitting. It is that good. On the first day of 7th grade (Danish 7th grade, so closer to our 8th/9th grade), Pierre Anthon announces to his classmates that nothing matters and nothing has meaning. We all begin to die as soon as we are born, so there is no point to anything or everything, he says. He proceeds to climb a plum tree in his yard and verbally harass the rest of his class as they walk to and from school each day. While they try to ignore him, his words start to crack their insulated teenage world. As a group, they decide Pierre must be stopped. The solution, the conclude, is to prove that life does have meaning. In order to prove meaning in life, the students begin collecting items that mean something to them. Each student demands a meaningful item from the next student in line. What starts out innocently enough quickly becomes more intense and eventually morbid. The students are falling down a slippery slope and falling out of control. This is a haunting book. Philosophical, thought-provoking, and horrifying all at once, I read Nothing in one sitting. Not a word is wasted by Teller and I found myself gasping at points. She does not delve into explicit details, but in some ways her terse wording is even more horrifying. 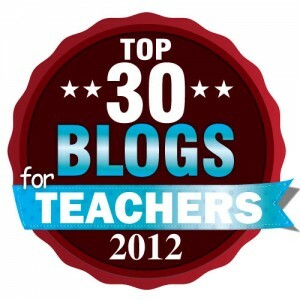 It is a perfect companion to Lord of the Flies and will be fantastic for class discussions. I’m considering it as a read aloud with my seniors. While the characters are not particularly memorable individually, they are disturbing as a group. As the reader, we don’t need to know them as individuals. It is the mob mentality that drives the book and drives the action. The group is not even redeemable in my eyes, but I still could not put the book down. It is completely haunting. And while the students are 13/14 in the story, the book is more appropriate for older students and even adults. I am shocked that I have not heard more about Nothing this year. It is without a doubt one of the best books I have read this year. It has classic written all over it. How is it possible that school starts in 2 weeks? I’ve been planning like crazy these last few days and I haven’t even been to my new classroom yet! I spent a day last week as a teacher/leader at the Monarch Teacher Network workshop so I am feeling refreshed and rejuvenated for the new school year. My summer isn’t complete until I’ve spent some time with my fellow colleagues in Monarchs Anonymous! Seriously, how is summer almost over?! Are you ready? Books I Brought On My Cruise! A chose a variety of genres because who knows what I will be in the mood for when the time comes! 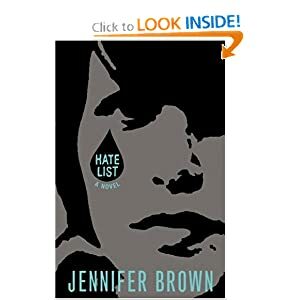 Jennifer Brown’s Hate List has been on my radar for a while. I finally got a chance to read it a few weeks ago and WOW. Why did I not pick this book up months ago? Brown has woven a powerful and intricate story of the ramifications of a school shooting that left me in tears for the last third of the book. We are talking real tears, not just a little weepy, people. I finished reading the book the night before my wedding and stayed up way too late because I couldn’t stand to put it down until I finished the story. At the end of their junior year, Valerie’s boyfriend Nick did the unthinkable. He brought a gun to school, where he killed six students and a teacher. Valerie was hit in the leg by a bullet while trying to stop him. Nick took his own life before the shooting was over, leaving a fractured and fragile student body behind. He also left Valerie behind to answer for what he had done, and what everyone assumes she was involved in planning. Now, it’s time for school to begin again and Valerie’s therapist thinks it’s best for her to try and go back to school. Though she could transfer, she doesn’t want to force her younger brother and her parents to start over again because of her involvement with Nick so she heads back to school. But as the killer’s girlfriend, she isn’t exactly welcomed with open arms. Her friends believe she knew Nick was planning to kill, her classmates blame her because she helped make the “Hate List” that Nick used to pick his victims, and even teachers and administrators have a hard time looking at her. I’ve read other books about school shootings but Hate List is at the top of the list. Brown presents realistic characters and draws the social archetypes of high school perfectly. She captures the reality of the social hierarchy in American high schools to a tee. Each and every character is well-drawn, from the main characters to the smallest secondary character. And the sign of true realism? I didn’t know if I believed Valerie for a good portion of the book. No one was innocent, but no one was to blame, either. Hate List is the most accurate look at school violence that I have ever read. And because this looks at the aftermath of the shooting, I saw a lot of the social interaction that happens in schools. Kids do fall back into the same routine, and adults have a hard time admitting that. Cliques exist and you won’t ever eradicate them because cliques are friends and we want our kids to have friends. Hate List brought up a lot of issues and I think it would make a great book to read as a school, class, or book club. This books BEGS to be talked about. This is an extremely powerful story and I spent the last third of the book in absolute tears. Highly, highly recommended for teens and adults.